As a reader of this website, you’re familiar with the “Collection Project,” our effort to put polymer art on the map and into the permanent collections of major museums throughout the nation. In order to ensure publication of the first hardcover museum catalog on the medium, and to help underwrite a major exhibition of polymer art at the Racine Art Museum in Wisconsin, we've set a goal to raise $100,000. You may have already decided to support that effort. But if you haven’t taken the time yet to write out a tax deductible check or link onto our PayPal quick donation button, we have a special incentive to offer you today. 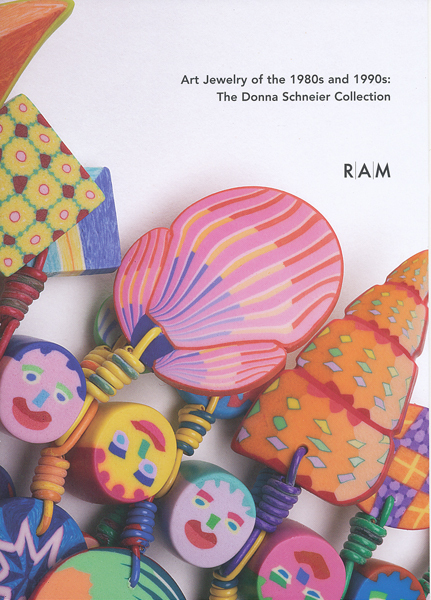 RAM’s current exhibition, The Donna Schneier Collection: Art Jewelry of the 1980’s and 1990’s, is complemented with a 20-page softcover catalog. As an example of RAM’s ongoing commitment to embrace polymer, the cover of this catalog features a gorgeous necklace by Pier Voulkos. For a donation of $100 or more, RAM will send you a copy of this catalog. But their offer is only good through November 30. So if you’re intending to donate, please do it quickly to ensure your premium. Making that donation today will bring us one step closer to our community’s goal. Either click on the secure PayPal button below, and then write “catalog premium” in the comment box of your order. Or make out a check to “RAM – Collection Project” and send it to the Racine Art Museum, 441 Main St., Racine WI 53403-1030. Note “catalog premium” on your check. All of us at Polymer Art Archive thank you for your support.